Age of deception is a nice headline, but we don’t live in an especially deceptive time, because deception, trickery, pretense, disguise is and always was a part of life. Most species, plants and animals alike, use it and most would not survive without it. Humans use it to mislead their enemies and gain competitive advantages. Politicians lie and smear their opponents to get elected, advertising and product placement in movies or TV shows make us buy overpriced and unnecessary products. Political leaders in collusion with generals and weapons producers try to incite disgust and hatred against other ethnicities, races, and nations to start costly and risky wars. The educated and tech-savvy populations of industrial countries should be able to see through the lies and deceptions, and yet, they fall again and again for the most crude and primitive fabrications and pranks. a.) As the virtual reality of TV, social media, and various internet echo chambers increasingly replaces real life, people experience the world through the displays of smartphones, computers, and TV. They are overwhelmed by the “information overkill,” bombarded non-stop with information from around the world with no time left to overthink and critically evaluate incoming news. b.) People are “dumbed down,” because an abundance of inconsistencies, fallacies, and delusions in movies, TV shows, advertising, and video games has made them tolerant and uncritical. Dedicated mainstream media users have switched off common sense long ago. The newest ploy to save Islamic terrorists in Syria is a prime example for this. 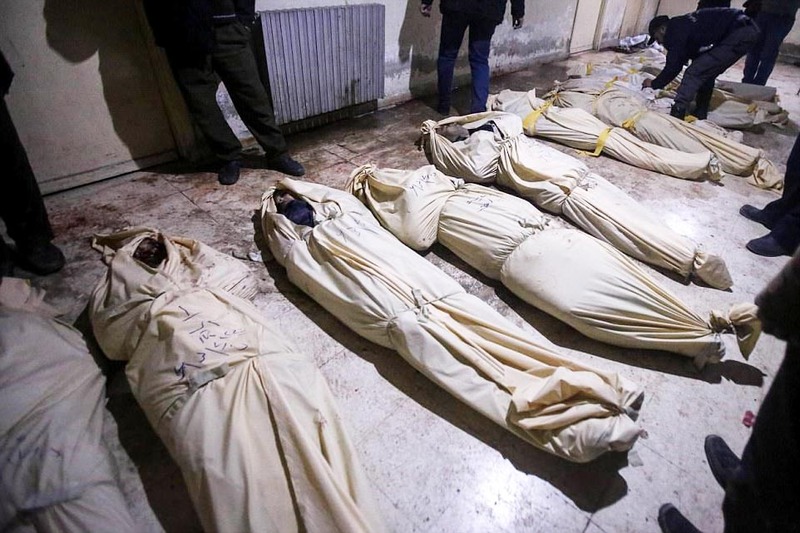 Jaysh al-Islam (army of Islam) plus the support groups White Helmets and SAMS (Syrian American Medical Society) reported a chemical weapons attack in Douma near Damascus, said to have taken place late Saturday, April 7. 42 people are claimed to have been killed. The reports are unverified and unconfirmed, which is even acknowledged by Western media. If an attack indeed happened, it is not clear who did it. The photos and videos, which form the body of (unverified) evidence, were produced by two groups which have an interest in fabricating atrocities to draw the USA more deeply into the Syrian conflict. Both groups, the White Helmets and SAMS, are funded by governments which openly seek regime change in Syria and look for a humanitarian pretext to justify their intervention in the country. The Western-funded White Helmets and SAMS are allied with jihadists and are active only in Islamist-controlled areas. The video clips and images prove nothing, since they could have been manufactured at any time and edited to serve their propaganda purpose. Trump’s recent musings about ending the US military occupation of Syrian territory east of the Euphrates River, including the country’s richest oil fields, was met by fierce Pentagon and CIA opposition. Fabricating an atrocity would pressure Trump to maintain the US occupation indefinitely and possibly escalate US military intervention in Syria. A year ago Trump authorized the launch of Tomahawk missiles to hit the Shayrat Airbase in Syria, in response to an alleged sarin attack on the village of Khan Sheikhun. A chemical attack by the Syrian government would be self-defeating and is therefore highly unlikely. The Syrian Arab Army is on the cusp of an inevitable victory in Eastern Ghouta. Why would it cancel its gains by handing the USA a pretext to continue its military intervention in Syria, especially in the aftermath of Trump signaling his intention to withdraw US troops? Beside that, it is difficult to see any military benefit of deploying chemical weapons. The Syrian military has more powerful means than chemical agents, whose effects are unpredictable and typically small scale. Russia has warned since two weeks of an impending “false flag” chemical weapons attack. Russia’s Foreign Minister Sergey Lavrov said, that Russian experts have found no trace of a chemical attack and members of the Syrian Arab Red Crescent didn’t find anything either. Animal (butcher) Assad, R2P (responsibility to protect), humanitarian intervention. No collection of evidence, no forensic research, no witness reports from all sides, no trial, no jury are needed. The self-appointed policemen of the word are the jury, the judges, and the executioners as well. They have made their instant judgement and they intend to enforce the punishment. According to the latest reports, several Israeli missiles struck the Tiyas airbase, known as T4, near the city of Homs in the early hours of Monday. The missiles flew through Lebanese air space. Iranian drones were hosted in the base. The drones stationed there were hit and a maintenance hub was destroyed/damaged. The T-4 airbase, located in the eastern province of Homs, simultaneously houses Syrian, Iranian, and Russian forces. Tonight, around 3:30 local time, the facility was hit by two Israeli F-15 multirole fighters, flying in Lebanese airspace. The Israeli strike targeted exclusively Iranian forces, which are located in the western part of the airbase. 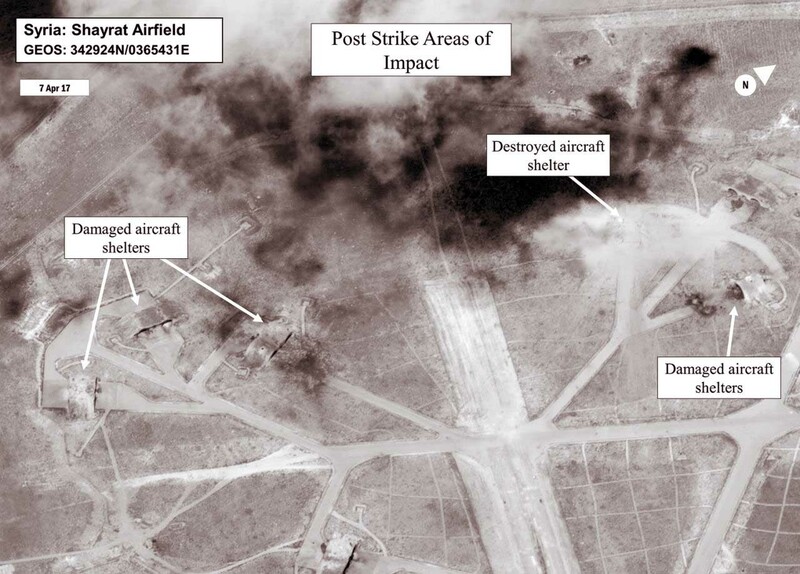 The damage is insignificant, the Syrian air fleet and the runway were not affected. At the moment, despite increased combat readiness, everything is working normally. The western part of the air base was reached by only three of the eight Israeli-launched missiles, five were destroyed by the Syrian air defense. As a result of the missile attack, seven Iranian servicemen were killed, and another seven were injured. You are currently browsing the archives for the Comments-old news category.